And now it's completely official: the new and freshened up version of Symbian we saw leak out over the weekend is indeed coming to Nokia's latest batch of handsets. The N8, E7, C7 and C6-01, the phones that ran what was formerly known as Symbian^3, will all be getting it "over the coming months," while the newly announced X7 and E6 devices will ship with it preloaded. The change list includes realhomescreen scrolling, an overhauled browser, and yes, even a QWERTY onscreen keyboard in portrait orientation. There's also new iconography and heavily refreshed Ovi Maps, which now include predictive search. Nokia is resolute in its belief that Ovi Maps is the best mapping solution on the market, and Microsoft's decision to integrate it into Bing would suggest that's true. 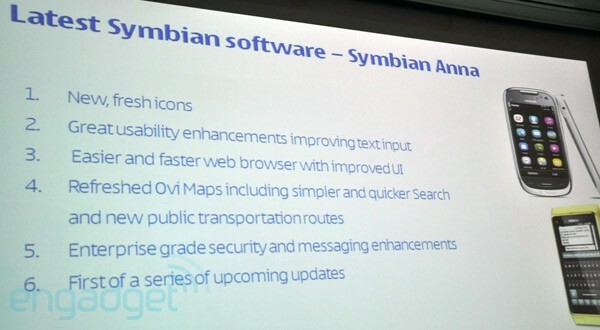 The "Anna" Symbian update will be the first of a series and has been driven almost entirely by consumer feedback. Nokia also shared some Ovi Store stats with us. There are now five million downloads per day going on from the company's app repository, which now includes more than 40,000 apps in total. 158 developers have passed a million downloads each. Full PR and video overview of the enhanced OS after the break.